"When in the sastra it is said that God has no form, it means that He has no material form. He has form; otherwise how can I think of His form? This Krsna's form is not like us. Just like if you take my statue or any other statue and if you pray or if you offer food, that does not go actually to the person. But Krsna's His anga, His form, is nondifferent from Krsna. Foolish people may say that 'These men, they are offering food to a marble statue. Everyone knows.' No. It is not the fact. The fact is Krsna is omnipotent. He can accept your service, becoming a marble statue. 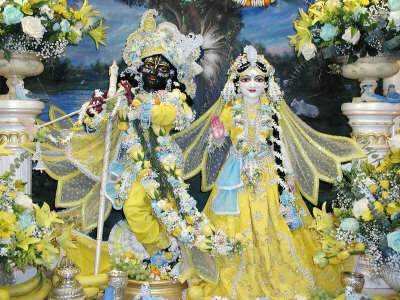 Because I cannot see Krsna by my present eyes, therefore He has appeared before you just like a marble statue. But He is not marble statue. We must know that. If you think, 'Here is marble statue, and if I commit some offense, who is going to see?' this is wrong conclusion. He is, Krsna, personally present here in a form which we can see. It is His mercy. It is called arca-vigraha. Krsna is everything. This marble is also Krsna's energy. Bhumir apo'nalo vayuh [Bg. 7.4]. So He can accept your service from any of His energy. The marble is also His energy, the water is also His energy, the air is also His energy -- everything. Without Krsna nothing can exist. So He is omniscient, all-powerful. He can accept your service through His energy. This is arca-vigraha."